Seed bombs come in a stock, screen-printed, organic muslin bag. These Bloomin ballistics are made from a mix of annual and perennial wildflower seeds and 100% post-consumer/recycled paper – just throw and grow! Make sure your target is tactical (somewhere that will receive consistent watering). So go ahead – bomb highway roadsides, sidewalks, medians, vacant lots, or even sabotage your own back yard. Bags of 3 or 6 bombs come in either a blank or one-color printable organic cotton bag, with growing instruction card inside. 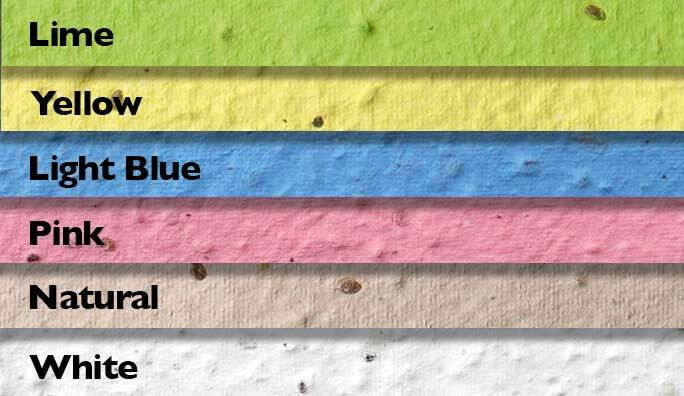 Choose from 21 colors of wildflower seed paper. Click here to view our Stock Seed Bomb Colors.